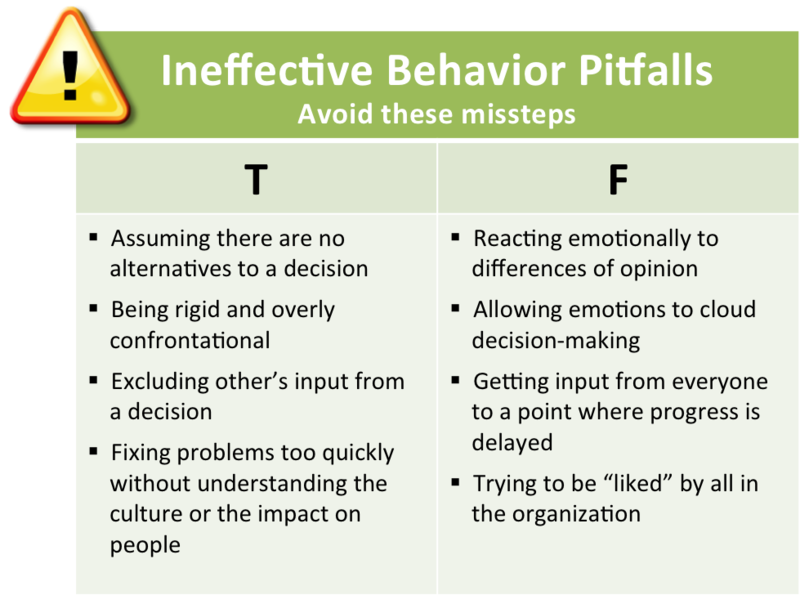 This is the fourth segment in our 5-part onboarding and MBTI blog series. Last month we looked at the Sensor/Intuitor dimension. This month we will focus on the Thinking/Feeling dimension and how these two preferences lead organizational change and develop relationships with Peers. 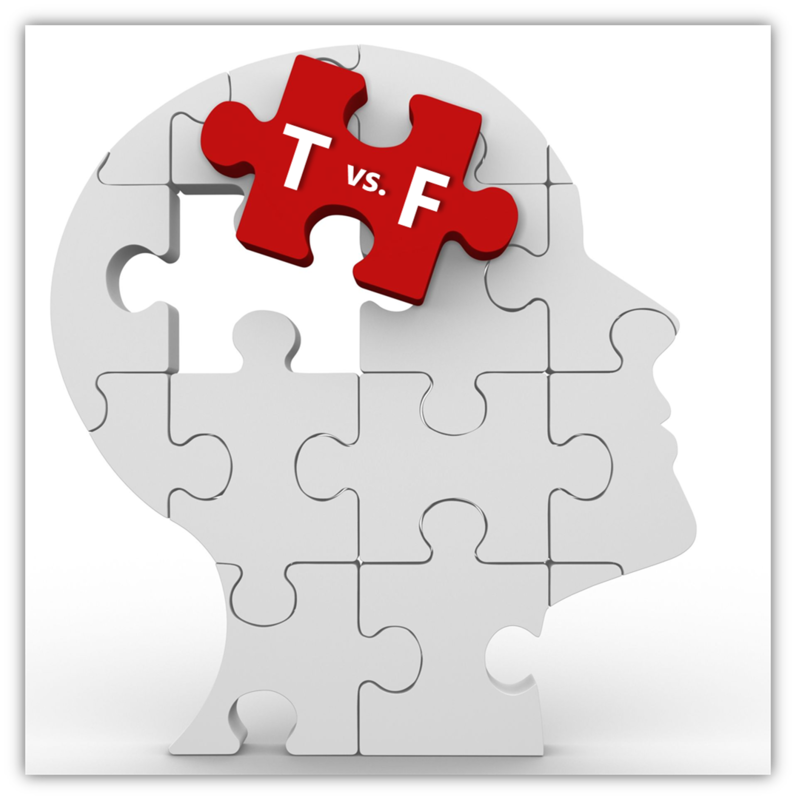 The T vs. F dimension is related to how we make decisions. Thinkers use logic and they value consistency when facing a decision. Feelers can come across as more empathetic, and encourage situational fairness in the decision-making process. Often New Leaders may step into a role confronted with a directive from their Hiring Managers to initiate changes. And when faced with this expectation, Thinkers and Feelers are likely to react to this situation differently. Thinkers are apt to lean toward logic in this arena. They may see an obvious problem in the organization and believe that it should be repaired immediately. As goal-oriented individuals, Thinkers will analyze the facts, look at data and draw their own conclusions. Once a decision is made by the leader, the next step is most often implementation. 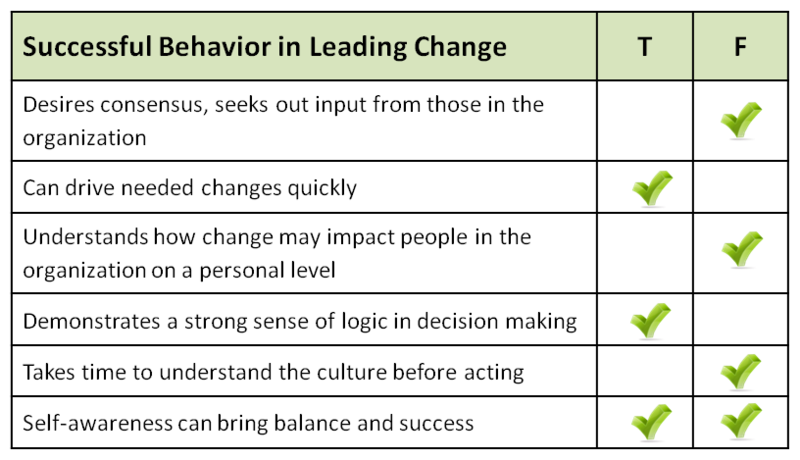 This linear way of operating usually produces faster action while implementing change. Feelers tend to consider the history and culture of an organization and the impact of the decision on its members when they see areas that need restructuring. Using a democratic approach, Feelers will seek input from those impacted by any alterations, and demonstrate that they value these contributions. Even if it takes more time to act, Feelers believe this step of interpersonal due process is important. Developing relationships with Peers is essential to onboarding success. Often it’s the colleagues on equal footing that will fill you in on the culture, tell you what has worked (and hasn’t) in the past, and explain how things are done and why. Thinkers, tending to be logical and objective, are often straightforward in their communication styles. They are likely articulate and clear. However, Thinkers might unknowingly plow through discussions, or skip the bonding “water cooler” conversations. Thinkers can also come across as rigid (especially to Feelers in the group), and their perceived lack of flexibility can create a divide. Feelers are often more people oriented, and may even be viewed as more “likeable” than Thinkers. Their ability to empathize can put most people at ease and break down barriers to communication. However, if pushed to the limit, Feelers can have an emotional reaction to internal conflict and be viewed as unprofessional or weak (especially to the Thinkers in the organization). The behavior associated with preferences of both Thinkers and Feelers can add value to any organization. But if one is sitting too close to either end of the spectrum, trouble may ensue. When it comes to leading change, Thinkers and Feelers have a responsibility to examine what is best for the organization. Is it more important to fix an existing problem now? Or, is it best to gather input from various levels to avoid alienating your Peers and Direct Reports? Should we use strict rules of thumb in decision-making, or does each area impacted by the decision need to be considered separately? Thinkers risk their support for being a change agent when they try to pluck the “low hanging fruit.” If you are in this position, remember that there is a reason this obvious problem perpetuates. The culture may support its existence, and a specific leader might even be responsible for the problem. Solicit others for feedback regarding the changes you want to make -- even the seemingly easy modifications. Encouraging involvement from your colleagues will also build the relationships you need to foster. Feelers can help others gain a sense of importance (and stake in the decision) by asking for input. But how far can this democracy go? Usually it is the right move to solicit feedback (especially as a New Leader learning the culture), but at what cost? Keep in mind that timing should also be considered when implementing change. Create some emotional distance when a choice needs to be made quickly. Otherwise missed opportunities may create turmoil in your onboarding process. And learning to separate emotions from decisions (if done in a balanced way) can increase your credibility among Peers. Knowing when and how to face change in a new role is no easy task. It takes effort and understanding for both Thinkers and Feelers. And interactions between Thinker and Feeler colleagues can be smoothed out by understanding your own preference and recognizing that you may be working with someone who views decision-making and relationships in a different way. If you have questions about how the T vs. F dimension could impact your onboarding process, contact us at info@leaderonboarding.com. Next month our series concludes with the Judging/Perceiving dimension.